RONALD Reagan once famously said the nine most terrifying words in the English language were ‘‘I’m from the government and I’m here to help’’. That’s all very pithy, but if Ron were alive in 2013 he’d know the nine most terrifying words are actually ‘‘Your phone is now being restored to factory settings’’. yourself, chum, because you’ve lost everything’’. It’s the message your mobile phone displays before it thrusts itself into a state of forced Alzheimer’s, cheerfully obliterating all your phone numbers, apps and photos and acting like you never existed. It’s like someone’s subjected your mobile to one of those special memory-wiper thingies from Men In Black, except Will Smith isn’t there to say something funny and make you feel better about it. When your phone displays this message, you have precious few options. The best is to shriek ‘‘NOOOOO!’’ and burst into tears. last weekend and I highly recommend it. It doesn’t actually achieve anything but it does make you feel marginally better, particularly when you follow it with a shot of whisky. In a case of spectacularly bad timing, my fruitbranded smartphone decided to pull the technological equivalent of a Fay Wray dramatic faint at 5pm on the Sunday before a public holiday. It was my fault actually – I had plugged it into my computer to ‘‘back it up’’, so I’d have a copy of everything just in case it ever . . . oh, wait. That’s ironic, isn’t it? Anyway, for whatever reason, my phone disagreed with this procedure and immediately began doing its best impression of a house brick. It was so accurate it could have launched its own Fringe show. Without wishing to overstate the situation, this was ABSOLUTELY THE WORST THING EVER. OK, so I’m being facetious (please don’t send me letters about how you had to live on rabbit and crackers during the war or whatever, really, I’m just joking) but if I’m being honest, the death of my phone felt rather like a death in the family. All the happy memories captured in thousands of photos – gone. Hundreds of songs that brightened up bus rides and entertained me on long dog walks – deleted. Special messages from friends and family, kept for posterity – trashed. After surviving numerous drops on concrete and several toilet bowl near misses and even that one time I accidentally left it in the fridge overnight, my little glowing friend had finally passed over into the digital afterlife. As I stared at its blank screen through tears, pouring shots and wailing about the text messages I’d lost, I realised my emotional attachment to this gadget may have got a tad out of hand. their digital missives or something, which I might have had time to consider if a tech support bloke hadn’t managed expertly to resuscitate my phone the next day. Yes, after 24 hours in tech limbo, my mobile was resurrected, its memory intact, in what can only be described as a pre-Easter miracle. It’s yet to start disseminating loaves and fish, but perhaps I need a software upgrade for that. 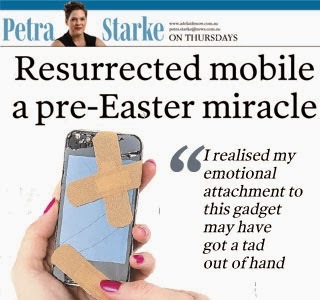 So, having unwittingly created my own modern-day parable, my advice is this: value loved ones, put down your phone occasionally – and never back up on a Sunday. Originally published in The Advertiser, March 14, 2013.